The LLEP Business Gateway is delivered by the Leicester & Leicestershire Enterprise Partnership (LLEP); a partnership consisting of Businesses, Educational Institutions, Local Authorities and Voluntary & Community Services. Increase the Gross Value Added (GVA) of the area by £4bn to £23bn. Please see below for a summary of the support they are able to offer. Click on the logos for a link to their respective pages. The Government have launched the GREAT Business site to provide support and advice to UK businesses. This is currently in Beta testing and users are encouraged to give feedback for future changes and improvements. De Montfort University (DMU) offer a wide range of support services to business. This includes areas such as Consultancy, Knowledge Exchange, Graduate Support and much more on their City Centre campus and Innovation Centre. Loughborough University provides a number of business support programmes. From collaboration and consultancy to access to facilities including their Science and Enterprise Park, there is something for businesses of all sizes. The University of Leicester has an impressive track record of delivering cutting-edge research in collaboration with industry and the public sector. Along with having a Silver rated Business School, they offer a wide range of business support and advice. 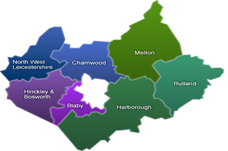 East Midlands Chamber covers Leicester and Leicestershire along with Derbyshire and Nottinghamshire; forming the second largest Chambers in the Country. There are numerous benefits to becoming a chamber member ranging from business support, business training, networking and information events to a wide range of discounted products and services. The Federation of Small Businesses (FSB) has over 200,000 members UK wide and along with providing lobbying and representation to support issues facing businesses; they also have a wide range of benefits for members. Areas covered include legal protection and healthcare as well as various campaigns to support small businesses. The Business section of Leicester City Council’s website has useful information for both those looking to start a business and those already up and running. Information includes key areas such as licences and rates as well as information on various support programmes and grants. The Business section of Leicestershire County Council’s website contains key information on where to obtain advice and guidance; including how to do business with the council. Alongside this there is also useful information regarding Broadband Leicestershire and property.